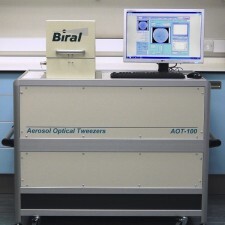 Biral has developed the AOT-100 Aerosol Optical Tweezer in collaboration with the Bristol Aerosol Research Centre at the University of Bristol making a cutting edge research technique available in a simple to use and convenient form. This unique instrument allows single aerosol particles to be held indefinitely in an optical trap whilst their properties are studied. With the ability to determine particle size and refractive index in real-time with unprecedented precision the AOT-100 has research applications in environmental chemistry, drug development and delivery, fundamental aerosol research and materials analysis. The AOT-100 allows users to hold airborne particles for extended periods with ease.